Moving Well returns February 22 in a new location! Valerie Lecomte is French and Canadian and we are pleased to have her join the TOTR roster! Read on to learn more about the great acting workshops Valerie is bringing to Utica Hall. Valerie has been acting for twenty years. She has taken part in feature films and short films, in France and Canada. She loves to play on stage too. She has also directed and acted in her own short film: À Coeur Ouvert (Paris, France). She is now in the process of producing a new short film. Valerie has been teaching acting techniques since 2009 (Vancouver and Toronto). For the last four years, she has embraced the Michael Chekhov Technique as an actor and a teacher, attending international workshops offered by the Michael Chekhov Association (MICHA, USA). In this On-camera workshop, participants become familiar with on-camera work, learning how to prepare a scene and to play it with in directions that can be used in the room or on set. Participants will gain confidence through exercises in front of the camera. Valerie starts with an active warm up and some exercises involving body and imagination, before moving on to short scenes, which are distributed, played on camera and directed. In the first class, a longer scene (2 to 3 characters) will be distributed for preparation and presentation during the second class. This scene will be filmed and directed. Through a prepared monologue learn the important tools of the Michael Chekov technique including qualities of movement, centers, psychological gestures and more. More details coming soon! 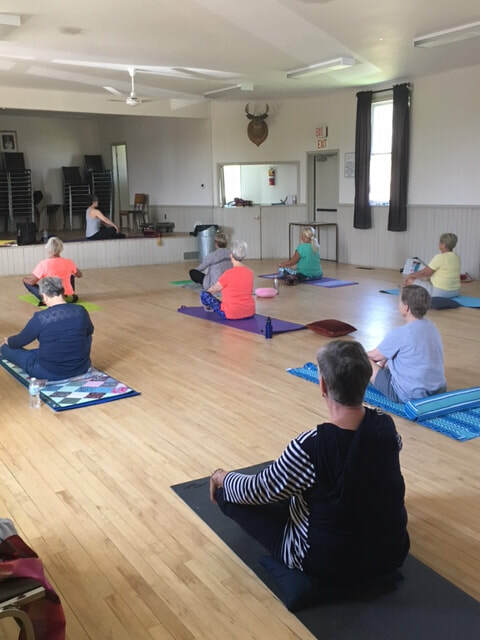 This non-aerobic class works with gravity, body weight, breath and relaxation to improve overall strength, flexibility, muscle tone, posture and alignment. The class structure is built on proven stretch and strength sequences, as taught and developed by Carey, while on faculty with The School of the Toronto Dance Theatre for over 15 years. These sequences have their roots in Nicklaus, Feldenkreis, and yoga techniques and are supplemented with additional sequences drawn from the work of neuromuscular therapist Irene Dowd. Moving Well is moderate to almost intense and is suitable for young adults and most adults of all ages and occupations. It is particularly helpful with pre-season sports conditioning, injury prevention and recovery (dependent on type and extent of injury), stress reduction and counters the negative impact of extensive sitting, now being recognized as a major contributor to poor physical wellbeing. Participants should be comfortable with sitting or lying on the floor for extended periods of time and we recommend that you consult with your healthcare practitioner prior to starting any new program of physical activity. For your comfort and ease, please dress in comfortable loose clothing and bring a firm pillow, towel and/or yoga mat. * no classes scheduled on statutory Mondays. ​** please make cheques payable to "Theatre 3x60". Stay tuned for the start of the next Smart Acts session! ​Michael Serres, founder of Smart Acts is offering a 6 week Introduction to Drama course for adults and seniors. Michael will be joined by Annette Stokes, a highly skilled theatre artist and educator well known locally through her work with Theatre on the Ridge, the Borelians Community Theatre, and other Durham region theatre groups. This fun and informal course will explore the use of voice and movement in creating interesting and compelling characters in support of dramatic storytelling. Due to the structure of this class, a minimum of 10 students is required. Why not come with a friend? Join members of Theatre on the Ridge for informal readings and theatre related presentations. Detailed schedule TBC.